1. Preheat the grill or light a barbecue. Cut the halloumi into thick slices lengthwise and place in a shallow dish. Mix together the chilli, basil, lemon zest, paprika, garlic and olive oil and pour over the cheese. Leave to marinate for 15 minutes. the onion rings next to the cheese and brush with the marinade. Cook alongside the halloumi for 4-5 minutes until charred. 3. Split the ciabatta, dip the cut side in the remaining marinade and toast on the barbecue until charred on both sides. 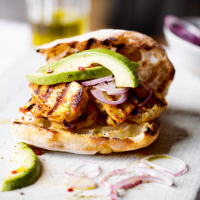 Pile on the cooked halloumi, avocado and onion, top with the other half of the ciabatta and press together firmly. Cut into wedges and serve.